The introduction of the new campaign by Calvin Klein is a paradigm shift aimed at improving the company’s sales position. The brand has had a rough patch in the last months in terms of sales. In a move to improve the condition, the company launched its first official digital marketing campaign on TikTok. 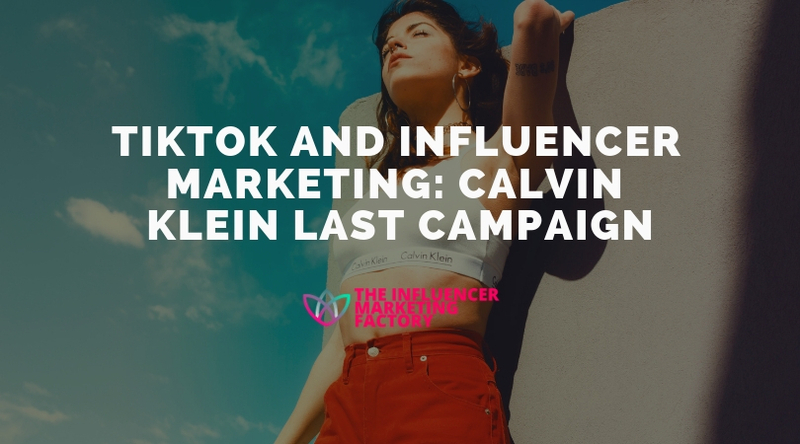 Calvin Klein has termed this influencer marketing strategy as #MyCalvin an approach meant to bring the concept of age to their brand. Calvin is hoping to find some relief in the hit social media app TikTok after they recently abandoned the runway scene. After their top fashion executive Raj Simons left the brand, they announced they would be restructuring their runway line and closing their offices in Milan. Simons was in charge of the runway scene, and his departure left a gap in the brand’s system. The significant revenue fall in the 2017-2018 financial year made the sales plunge even further. Now, Calvin Klein intends to come back stronger than ever by rocking the social media scene. A week into their runway announcement, they debuted their first influencer marketing campaign on TikTok. Their first and latest iteration of the campaign is the use of influence and celebrities with reasonable cultural capital among the younger generation to promote their #MyClavin campaign. Celebrities such as Shawn Mendes, A$AP Rocky, and Kendall Jenner were featured in the Calvin Klein’s underwear and jeans ads. Calvin Klein is not known for their enthusiasm in the digital marketing scene; it took some reshaping and came as a surprise when they took on a relatively new platform. Nevertheless, owing to the potential that TikTok holds and their successful pattern over the last months, the circumstances Calvin Klein find themselves in are well planned and likely to propagate the brand to a new level. Unlike other platforms where pay-to-play features are quickly draining their relevance, TikTok’s impact is mostly acclaimed to the organic opportunities and ripples of influence it creates. As evidenced by the user’s interaction, it has become enticing without necessarily saturating it with paid promotions. With the competition getting stiffer and resources dwindling, Calvin needed a cheap way out, and TikTok was an excellent start to experiment. Since TikTok’s debut in China as Douyin, before going global after a year as TikTok. The platform has become a tempting new arena for most brands. Like the now-defunct vine, the platform allows users to create looping videos. It has over 500 million users worldwide, and the numbers are expected to reach 1.6 billion by 2020. While the stats are in favor of other social media platforms, the numbers are impressive considering it debuted only two years ago in China. The youth audience further increase the viability of the platform as a digital marketing channel, and Calvin Klein spotted the opportunity. Ultimately, unlike other platforms where competition for influencers is saturated, TikTok is just starting to make its marks in the digital marketing industry. For instance, very few fashion brands have embraced the app, Guess was the first fashion brand to feature their denim products on the app, and Calvin Klein seems to have noticed the impressive results Guess has had with Gen Z and TikTok. The platform is not as big as the pioneers, but the engagement from the users surpasses the rest. TikTok has an impressive youth audience, and the engagement is remarkable. The youth aged 16-24 make up a larger percentage of the users on the platform, 60 percent. Facebook has become relatively blunt with the demographics spanning beyond 50 years. The younger generation has been looking for a different environment, and TikTok was a perfect way out. Calvin Klein seems to have noticed this and are slowly creating a community by influencing the right audience. So far, the numbers are in favor of Calvin Klein. Twenty-four hours after launching their digital marketing campaign o TikTok it became their most successful digital campaign; surpassing their 2015 Justin Bieber campaign by ten times. For Calvin Klein, the only challenge that stands in their way is maintaining their identity as they reach out to a new and younger audience.